rt training in modern Britain is a well-established path. Students typically complete ‘A’ (Advanced) Levels or a vocational equivalent, followed by a Foundation Course and a degree at university. 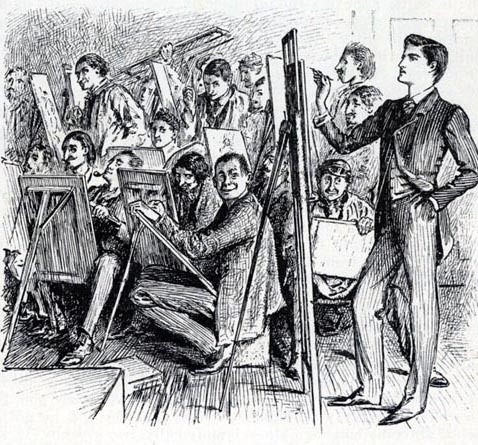 In Victorian Britain, on the other hand, the absence of state-sponsored provision meant that budding artists engaged with a variety of unregulated opportunities. This was a mixture of home-tuition, experience in a studio or workshop, formal art-training at one of the primary institutions and finally – and for the most able – professional studies at the Royal Academy. Much of the work was conducted at home, usually under the direction of a drawing-master or established artist. 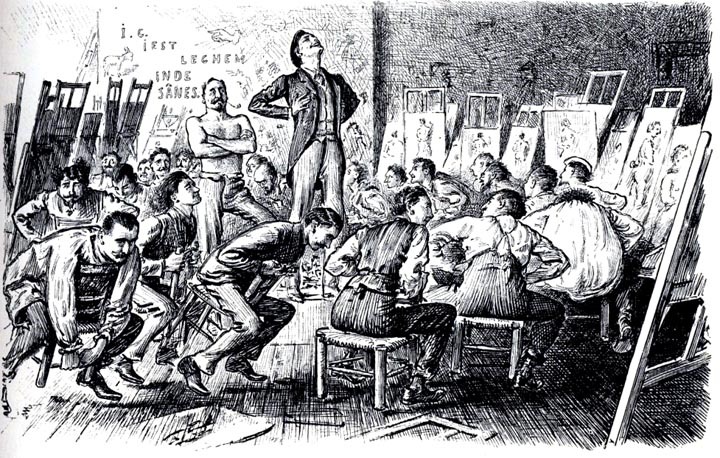 The precocious Millais was coached by the historical painter E.H. Wehnert, and Richard Doyle was instructed by his father John, the satirical cartoonist known as ‘H. B’. (Engen, p.15). This emphasis on home-based learning is shared by artists of every sort; however, there are clear differences between the training of a painter, and the vocational education of those intending to become a graphic artist or illustrator. 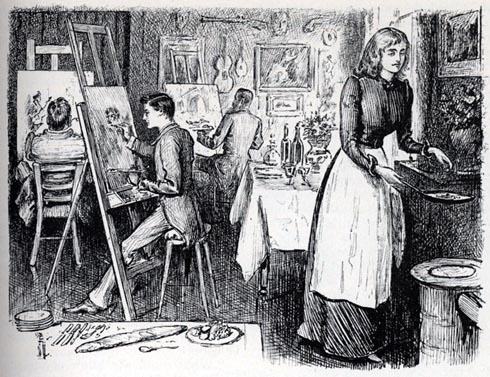 In the early Victorian period illustrators and print-makers were principally trained in workshops where they learned the techniques of etching, lithography and wood-engraving. Regarded as artisans rather than artists, these graphic designers learned the technicalities of their trade, rather than the skills of draughtsmanship. A good example is Phiz, who was apprenticed to the engraver Finden (Lester, pp. 32–34), and Cruikshank was similarly trained in his father’s workshop. This educational process was sometimes systematically arranged, but was more typically a matter of a specific skill being taught ‘on the job’ and under the commercial pressure of completing a piece of work to a deadline. The practicalities of the situation are exemplified by Doyle’s ‘training’ at Punch; familiar only with the discipline of working on paper, the artist had to learn how to draw on wood. The engraver Swain amusingly describes his attempts to instruct the ‘agitated youth’ who ‘literally dodged around’ (Engen, p. 46) the table as the exasperated technician tried to show him how to make decisive lines with a hard pencil, in reverse, on a smooth block painted in Chinese White. Such ad hoc arrangements are typical. Interestingly, there was no training whatever in the intellectual skills required to illustrate a literary text; this was assumed to be innate, whereas making the image itself was a craft-skill that had to be learned. For painters, on the other hand, the emphasis was placed on becoming literate in the language of art and all of its complications. Draughtsmanship, composition, copying from nature, modelling, perspective, the uses of colour and every other aspect of the profession were taught. Some older students trained in studios; the model was the French atelier system and several trained in France. Du Maurier famously trained at Gleyre’s, immortalising his experiences in Trilby (1895); Whistler also studied abroad. For younger students, though, the usual route was to gain entry to one of the London-based schools offering courses that prepared them for studies at The Royal Academy. The two pre-eminent institutions were Sass’s and Heatherley’s. These became rivals, and were in many ways quite dissimilar. The most famous of the London art-schools was Sass’s. This was regarded as an elite institution which set out to prepare (male) students for The Royal Academy just as Eton prepared its pupils for entry into Oxbridge. Set up by Henry Sass (1788–1844) in 1813, it moved in 1820 to No. 6, Charlotte Street, Bloomsbury. It was the first school to teach its students in any methodical way, and it occupies an important place in the development of Victorian art. Its list of alumni is certainly impressive. These premises were attended by Millais, Cope, Frith, Corbould and Deverell. Under the management of Stephen Cary (changing its name in 1842 to Cary’s), the school also trained Rossetti, Edward Lear, Simeon and Abraham Solomon, Henry Wallis and Braithwaite Martineau. Sass had initially established his school because he was unable to make a living as a painter, producing works of only limited appeal. As contemporaries observed, it was somewhat ironic to observe that an artist who had failed to make a career as a professional in his own right was entrusted with developing the abilities of those whose talents were far in advance of his own (Frith, p. 32). According to John Callcott Horsley, his abilities as a painter were ‘nil’ (p. 32). Sass was nevertheless an astute educator (and businessman) and his college developed a reputation for excellence. Essentially a selective, fee-paying public school in the manner of others of the time – even if it only took a maximum of eighteen students, some of whom were boarders – its history involves the personalities of the proprietor, the daily life of the youths who attended, and the curriculum they followed. Like all public schools, it was characterized by rituals and traditions, and ultimately generated a series of mythologies. An important ingredient was Sass’s character, and assessments of his personality vary. Many were positive. Though other instructors were employed, much of the work was done by Sass himself, and surviving accounts speak of him in affectionate terms as an able teacher. In The Newcomes (1855) Thackeray (who knew graduates of the school) includes an amusing account in which a Mr. Gandish is clearly modelled on Sass, and is used to comment on his real-life prototype. According to Thackeray, Gandish/Sass is ‘an excellent master’ and a ‘good critic’. He is, furthermore, a practised educationalist who knows how to balance praise and blame, encouragement and heading off mistakes before they become a problem. Mr. Gandish, Thackeray tells us, ‘was always’ giving out ‘sweetmeats of compliments and cordials of approbation’ (The Newcomes, 2, p. 168). Frith, who was a student at the school, takes a parallel view. Mr Sass was accustomed to giving a series of conversazioni, at which great artists and other distinguished men were present. Etty, Martin (certainly one of the most beautiful human beings I ever beheld), and Constable were frequent visitors. We had dinners and dances, too. Who that had once seen Wilkie dance a quadrille could ever forget the solemnity of the performance … [p.33]. Others were less impressed, and regarded these displays as little more than self-promotion, the actions of a failed artist who tried to bolster his reputation through a process of association. Commentators generally agreed that Sass was a good teacher, but his flamboyant mannerisms irritated many. John Callcott Horsley describes him as ‘extraordinarily pompous’, a man ‘eaten up by vanity’ who had a Dickensian taste for ‘extravagant waistcoats of cut velvet’ (p.23), and Rossetti and Holman Hunt were equally critical. However, the final words must be Frith’s. Frith regarded Sass as glamorous rather than vain, a man whose presence was enough to inspire his pupils in a way some teachers can: a unique quality. The artist completes his account by speaking compassionately of Sass’s later infirmity. While still in charge of the school, Sass began to behave in a disturbed and illogical way. Frith sadly notes how the Professor’s ‘temperate habits’ (p.35) gave way to curious behaviour and repetitiveness, symptoms the artist describes as a ‘sad affliction’ (p.37), and are instantly recognisable, at least to modern eyes, as the onset of Alzheimer’s disease. This led to his retirement; the school was bought and run by Carey, continuing the methods of its founder. There are no official histories of the school, and no objective accounts of the students’ everyday life. There are anecdotes and satirical commentaries. Veering between the dramatic and the humorous, they probably give a truthful representation of everyday routines and rituals. Caricatures of the students of course were passing constantly among them, and in revenge for one which a huge red-haired Scotch student, Mr. Sandy McCollop had made of John James, Clive perpetrated a picture of Sandy which set the whole room in a roar [so that] the Caledonian giant uttered satirical remarks against the assembled company, averring that they were a parcel of sneaks, a set of lick-spittles, and using epithets more vulgar …[I, 169]. At Mr Sass’, as at most of the schools of the day, a good deal of bullying went on, and one of the students [made Millais’s] life a burden to him. The state of things reached a climax when, at the age of nine, young Millais gained the silver medal of the Society of Arts, for which this youth had also competed. The day following the presentation Millais turned up as usual … and after the morning’s work was over, H. (the bully) with the help of two other small boys whom he had compelled to remain, hung him head downwards out of the window, tying his legs up to the iron of the window-guards and scarves and strings. There he hung over the street in a position which shortly made him unconscious, and the end might have been fatal had not some passer-by, seeing the position of the child, rung the door-bell and secured his immediate release [12 –14]. This extreme event is emblematic of a serious problem, although J. G. Millais takes some pleasure in noting how the bully was expelled ‘and came to a miserable end’ (I, 14). Like any other school of its period, Sass’s nurtured youthful talent while accommodating the influence of a sometimes brutal machismo. There are no surviving documents that give precise details of time-tables or schemes of work, but the content of the curriculum is well-known. This was extremely traditional, and set out to teach the skills required to become a painter. Rigorous and exacting, it imposed the high standards expected by The Royal Academy. Perspective and the uses of colour were part of the curriculum, but the training was focused on draughtsmanship, essentially drawing the human form. Students sometimes drew from the life, with male models as their subjects; but most of their time involved copying from prints and plaster casts of sculpture. The emphasis was purely on the classical: Antique statuary was presented as the aesthetic ideal and the students occasionally drew from the Elgin Marbles, which were close at hand in the British Museum (Gillett, pp. 74–75). Students rarely handled a brush; as Jan Marsh remarks, practically ‘all [of the] work was in pencil and, as stale bread was used as an eraser, the studio was ankle-deep in crumbs’ (p.11). The course of general training usually lasted two years and was sometimes extended to three. Progress was monitored by regular inspection of a portfolio. Transition between years was allowed once the candidate had convinced Sass of the quality of his drawing, and entry to The Royal Academy was only realised when a ‘perfect portfolio’ had been produced, containing exemplary drawings of musculature, torsos and articulated forms. Many students who worked [at Carey’s] shaded their drawings with the most regular cross-hatching, putting a dot in every empty space; thus the figure was blocked out into flat angular surfaces … For all such systems I had neither time nor inclination … It [appeared to me] a waste of effort for an artist to rival the precision of an engine turning on a watch [I, 34-35]. Rossetti, predictably, was just as dismissive. A student at Carey’s, Rossetti studied from a human skeleton and some classical drawings; but he soon grew bored and after about a year (in 1844) his attendance declined. Jan Marsh ascribes his truancy to troubles at home (p.15), but in reality this type of hermetic copying from nature was never likely to appeal to Rossetti’s emphasis on atmosphere and passionate feeling. Interestingly, he never mastered the skills promoted by the school, and remained relatively untutored. Engen, Rodney. Richard Doyle. Stroud: Catalpa Press, 1983. [Frith, W.P.]. A Victorian Canvas, The Memoirs of W.P. Frith. Ed. Neville Wallis. London: Bles,. 1957. Gillett, Paula. The Victorian Painter’s World. Gloucester: Sutton, 1990. Holman Hunt, William. Pre-Raphaelitism and the Pre-Raphaelite Brotherhood. 2 vols. London: Macmillan, 1905. Horsley, John Callcott. Recollections of a Royal Academician. London: John Murray, 1905. Lester, Valerie. Phiz: The Man who Drew Dickens. London: Chatto & Windus, 2004. Marsh, Jan. Dante Gabriel Rossetti: Painter and Poet. London: Weidenfeld & Nicolson, 1999. Millais, John Guille. The Life and Letters of John Everett Millais. 2 vols. London: Methuen, 1899. Thackeray, W.M. The Newcomes: Memoirs of a Most Respectable Family. 2 vols. London: Bradbury & Evans, 1855.